A third factor, perhaps the most likely, was the existence in Middle English of varieties that had in Old English times undergone voicing of initial fricatives. Many southern dialects had voiced at least initial /f s/ --- a development whose relics survive still in the rural West Country ('Zummerzet'). This parallels, and may well stem from, the same process in continental West Germanic: the <v> in G Vater 'father', now pronounced with /f/, and Du. initial <v> and <z> in vader and zon 'sun' (/f s/ in more innovating dialects, still /v z/ in conservative ones) reflect this. 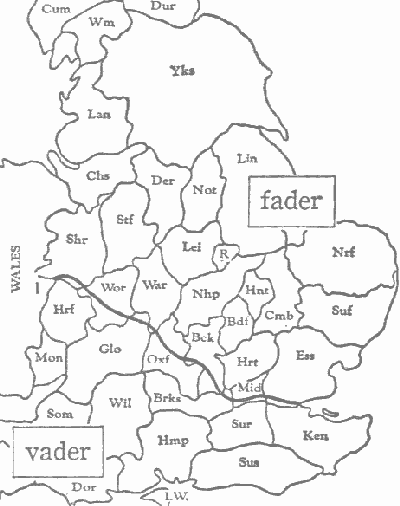 While the voicing in England was mainly southern, it did extend well up into the midlands in Early Middle English, and the standard still has a number of forms with voiced initials like vat, vixen, vane (OE fæt, fyxen, fana). Contact between speakers of these dialects and others without voicing may have facilitated borrowing of French /v z/, making them less 'outlandish'. ・ Kurath, Hans, Margaret S. Ogden, Charles E. Palmer, and Richard L. McKelvery. Plan and Bibliography. U of Michigan P, 1954. Danish may also have influenced the pronunciation of an initial <s> or <f> in words such as fox and sing. In the Danelaw, as in North Germanic, these remain unchanged [s, f], but there is widespread evidence of the pronunciation [z, v] in the area controlled by Wessex (Poussa, 1995). The distribution is confirmed by placename evidence (Fisiak, 1994). Similar forms are found on the European mainland: for example, the <s> of German singen is pronounced [z], and the <v> of Dutch viif ('five') is more like an English [v] than [f]. Some [v]-forms have become part of Standard English: for example, vat (cf. German Faß), and vixen alongside fox, but otherwise the [s, f] forms have become general, and [z, v] survive only in isolated pockets. ・ Poussa, P. "Ellis's 'Land of Wee': A Historico-Structural Revaluation." Neuphilologische Mitteilungen 1 (1995: 295--307). ・ Fisiak,J. "The Place-Name Evidence for the Distribution of Early Modern English Dialect Features: The Voicing of Initial /f/." Studies in Early Modern English. Ed. Dieter Kastovsky. Berlin: Mouton de Gruyter, 1994. 97--110. ・ Nielsen, Hans F. Old English and the Continental Germanic Languages: A Survey of Morphological and Phonological Interrelations. Innsbruck: Innsbrucker Beitrage zur Sprachwissenshaft, 1981. In sum, I submit that, whereas the original advance of the initial fricative voicing innovation through the OE dialects is a natural and not unusual phonetic process (it has its parallels in other Germanic dialects on the continent), the halting and then the reversing of such an innovation in ME is an unexpected development, requiring explanation. It can only be explained by some kind of intervention in the dialect continuum. The Scandinavian settlement of the north and east Midlands in the late OE period seems to supply the right kind of intervention at the right place and time to explain this remarkable linguistic U-turn. It seems to me that the voicing of initial /f-/, /s-/, /θ-/ and /ʃ-/ in OE and ME, which Fisiak convincingly argues are caused by one and the same lenition process, is precisely the type of rule which is typically jettisoned when a language is pidginized or creolized, and acquired only partially by learners of a new dialect. Furthermore, why should the speaker of a Danelaw dialect of English want to sound like a southerner, whether he lives in his home district, or has been transplanted to London? It would depend on what pronunciation he (or she), consciously or unconsciously, regarded as prestigious. 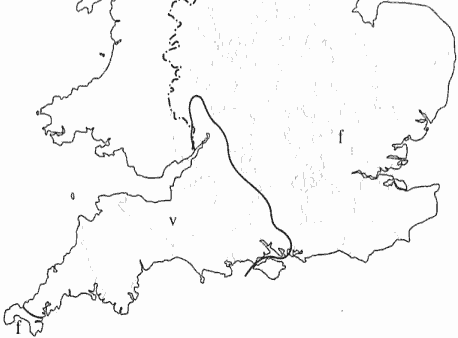 If this explanation is accepted as the reason why such an expansive lenition innovation stopped at approximately the Danelaw boundary during the late OE or early ME period, then the reason why the area of voicing subsequently receded southwards is presumably related: migration of population and the rise in the social prestige of the East Midland dialect meant that the phonologically simpler variety became the standard to be imitated. ・ Poussa, Patricia. "A Note on the Voicing of Initial Fricatives in Middle English" Papers from the 4th International Conference on English Historical Linguistics. Ed. Eaton, R., O. Fischer, W. Koopman, and F. van der Leeke. Amsterdam: Benjamins, 1985. 235--52.